x2 Cause of blindness is given by applicant for admission. Records [illegible] wholly untrustworthy. Eye Defect and Blindness Organ of Sight Industrial Home for Adult Blind, Oakland, Cal. 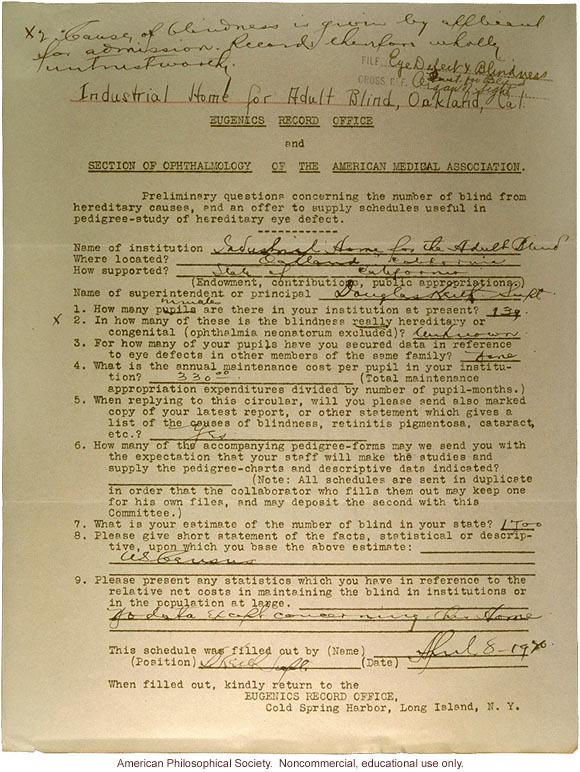 Eugenics Record Office And Section of Ophthalmology of the American Medical Association. Preliminary questions concerning the number of blind from hereditary causes, and an offer to supply schedules useful in pedigree-study of hereditary eye defect. Name of institution Industrial Home for Adult Blind Where located? Oakland, California How supported? State of California (Endowment, contributions, public appropriations) Name of superintendent or principal Douglas Keith, Supt. 1. How many pupils are there in your institution at present? 139[?] 2. In how many of these is the blindness really hereditary of congenital (ophtalmia neonatorum excluded)? Unknown 3. For how many of your pupils have you secured data in reference to eye defects in other members of the same family? None 4. What is the annual maintenance cost per pupil in your institution? $330.00 (Total maintenance expenditures divided by number of pupil-months.) 5. When replying to this circular, will you please send also marked copy of your latest report, or other statement which gives a list of the causes of blindness, retinitis pigmentosa, cataract, etc.? Yes 6. How many of the accompanying pedigree-forms may we send you with the expectation that your staff will make the studies and supply the pedigree-charts and descriptive data indicated? (Note: All schedules are sent in duplicate in order that the collaborator who fills them out may keep one for his own files, and may deposit the second with this Committee.) 7. What is your estimate of the number of blind in your state? 1,700[?] 8. Please give short statement of the facts, statistical or descriptive, upon which you base the above estimate: US Census 9. Please present any statistics which you have in reference to the relative net costs in maintaining the blind in institutions or in the population at large. No data except concerning this home. This schedule was filled out by (Name) April 8, 1920 (Position) D. Keith, Supt. (Date) When filled out, kindly return to the Eugenics Record Office, Cold Spring Harbor, N.Y.